Potatoes are a mainstay in our cupboard because these are very versatile veggies. It can be as simple as being fried with eggs for breakfast, or it can be used in more elaborate dishes such as adobo, giniling, afritada, mechado, and loads more! We used to buy the scrubbed variety, but have since changed to purchasing the unscrubbed ones as influenced by the TV show River Cottage. We learned that the dirt enveloping the potato acts as protection from bacteria. It also keeps the potato protected from exposure to moisture, prolonging its life. Plus, we wash the potatoes anyway before using these so purchasing scrubbed potatoes is not really necessary! So we have since then been purchasing these unscrubbed. Do not expose the potatoes to sunlight as this can cause solanin to form which can cause adverse effects to health (headaches, diarrhea, cramps). Store potatoes in a paper bag. 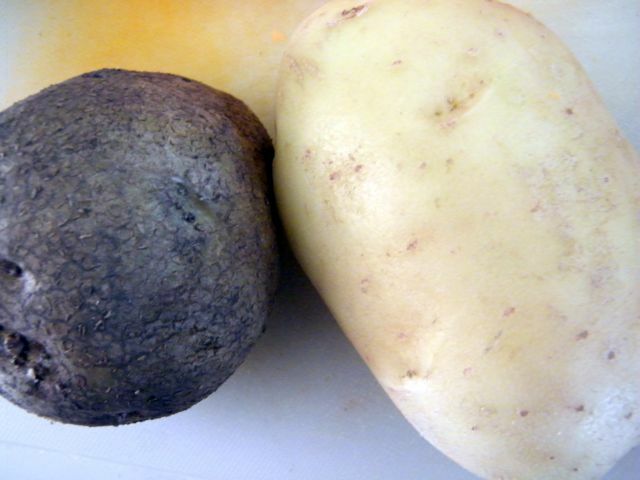 Do not refrigerate potatoes, as they will develop dark spots and affect the taste. Even then, properly-stored potatoes last for a few weeks only. So do not leave them waiting too long. Have you tried planting potatoes? I have, and I can tell you it's quite a rewarding experience. Do not use the potatoes you buy from the market, however. Use "seed potatoes" which are sold by gardening suppliers (in our case, we bought ours at The Warehouse). They're not fussy to grow. I loved watering them everyday. And even if you do not have space for it, you can grow these in buckets! They're popularly called bucket potatoes (d'oh! ).